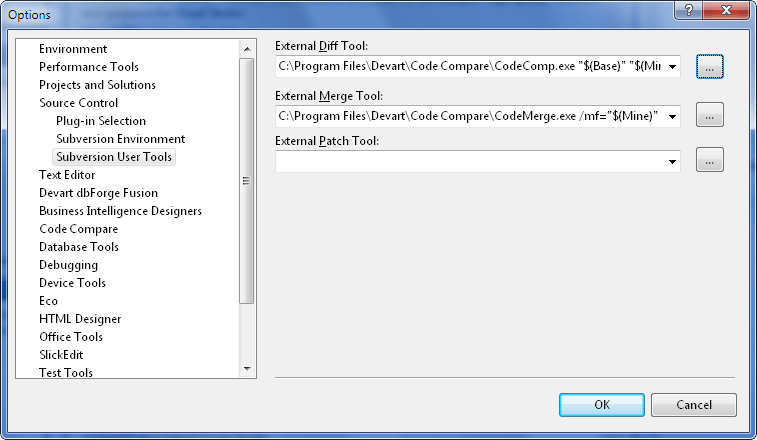 Select the Tools → Options item in the Visual Studio main menu. Switch to the newly opened window and go to the Source Control node. 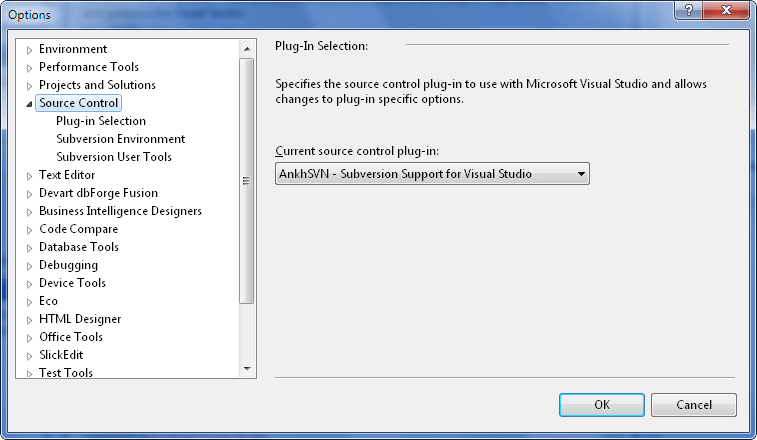 Go to the Plug-in Selection tab and select the AnkhSVN - Subversion support for Visual Studio item from the Current source control plug-in drop-down list. Go to the Subversion User Tools node and specify diff and merge tools. Diff tool: "[InstallationDir]\CodeCompare.exe" /SC=SVN /t1="$(BaseName)" /t2="$(MineName)" "$(Base)" "$(Mine)"
Merge tool: "[InstallationDir]\CodeMerge.exe" /SC=SVN /BF="$(Base)" /BT="$(BaseName)" /MF="$(Mine)" /MT="$(MineName)" /TF="$(Theirs)" /TT="$(TheirsName)" /RF="$(Merged)" /RT="$(MergedName)"
Note: Use your product installation folder instead of [InstallationDir]. By default, it is C:\Program Files\Devart\Code Compare. For a brief introduction to the features of our diff and merge tool, refer to the product's overview page.